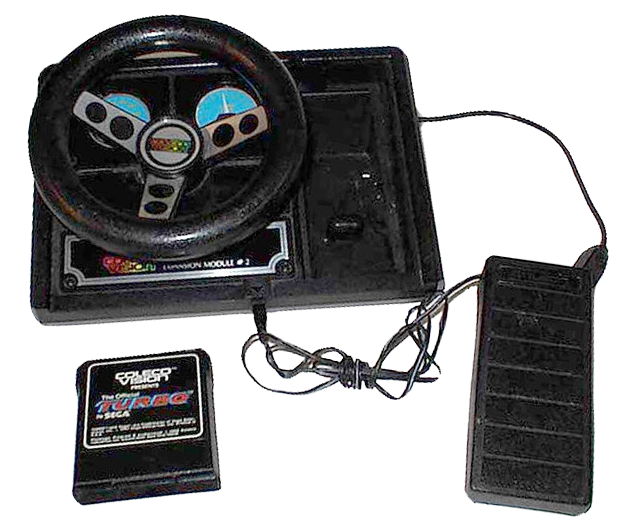 Expansion Module #2 is a driving controller (steering wheel / gas pedal) that came packaged with a port of the arcade game Turbo. The gas pedal is merely a simple on/off switch, so many games used the second ColecoVision controller as a gear shift for more precise speed control. Although Coleco called the driving controller an expansion module, it actually plugs into the controller port, not the Expansion Module Interface. The driving controller is also compatible with the games Destructor, Bump n Jump, and Dukes Of Hazzard.